Quan Am Buddhist Monastery and Temple offers Weekly Meditation and Dharma Talks with Question and Answer period, in English, led by a Buddhist Monk, at 6pm Every Friday and 10am every Sunday. 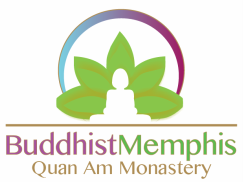 Newcomers are especially invited to attend 6pm Every Friday Meditation and Dharma Talk held in the Quan Am Buddhist Temple, 3500 Goodlett St., Memphis, TN 38118. 2) A period of "Silent Sitting Meditation. 3) Dharma Talk with Questions and Answers. Please join us 6pm this Friday and 10a Sunday for the Weekly Meditation and Dharma Talk. We would enjoy meeting you and perhaps then we can discuss your questions. Call: (901) 679-4528 to speak with someone in English. WHEN: 8:00p.m. Every Evening Except on Sundays.